A month ago, I started participating in my first Kaggle competition. I wanted to start participating in Kaggle competitions for a while and Facebook launched a recruiting competition: Human or Robot?, and I decided to join the party. This blog post is a (slightly modified) export of my IPython notebooks written for this competition. Well… Let’s get started! TL;DR: I used a bunch of basic statistical features extracted from aggregation of bids of each bidder and trained a Random Forest tuned by 10-fold-CV. Plain and simple. 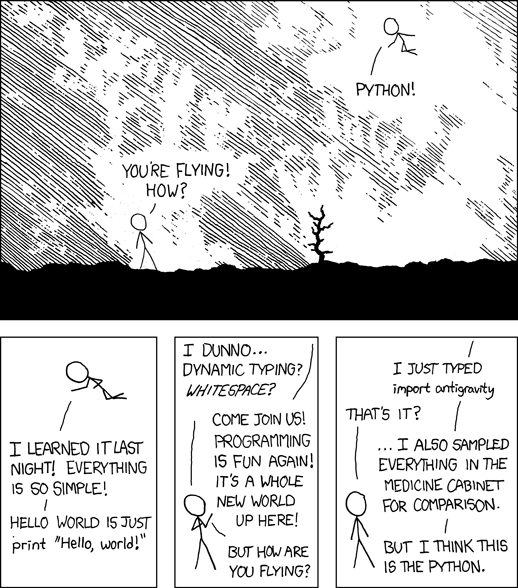 Nothing fancy here, we just use some classical Python Data Science libraries: numpy, scikit-learn and pandas, plus pickle to save the result. First step is to read the CSV files and load them as Pandas frames. I used Pandas here because of the “heavy” work needed to create the features, being very easy to do with Pandas and that would have been much more painful to do with numpy only for example. Prior to the feature creation, some inspection on the data has been done, of course, but I didn’t kept any trace of this quick’n’dirty work anywhere and won’t be able to show it to you. The idea is to get to know what’s in the dataset. The first step is just to show look at the raw data, and to then look at some stats about the data. For example, the first thing you might wonder is what the heck can I do with those payment_account and address hashes that Kaggle gave me for each bidder. Is there any of these things that appear more than once? Nope, they are as unique as the bidder_id so you can throw this away. At this moment you know that all your features must come from the bids themselves. … and then there is a moment when you decide that it’s time to get this party started and start to do something with these bids. The things I hesitated about was to decide if I should predict if a bidder is a bot based on aggregates of info about his bids, or if I should predict if a bid has been made by a bot for each bid and then aggregate the predictions at bid level to create a prediction at bidder level. I preferred to work at the bidder level because I had the feeling that each bid don’t have enough info by itself to allow proper prediction, and that the aggregation of a set of bids would allow me to create more high level features about the general behavior of a bidder and therefore get more useful info. I didn’t have the time to actually try the bid-level prediction approach. I don’t know how it would have turned out. merchandise (category) – The category of the auction site campaign, which means the bidder might come to this site by way of searching for “home goods” but ended up bidding for “sporting goods” – and that leads to this field being “home goods”. This categorical field could be a search term, or online advertisement. time (real) – Time that the bid is made (transformed to protect privacy). ip (category) – IP address of a bidder (obfuscated to protect privacy). url (category) – url where the bidder was referred from (obfuscated to protect privacy). We only have one real feature and lots of categories. My first approach was what I’ve seen called “kitchen sink approach”, I basically decided to compute whatever statistical computation crossed my mind (as long as I wasn’t too lazy to implement it so it had better be simple or genius). I decided to apply the same analysis on all categories. And the same idea goes for the real variable, with different stats of course. For time, I decided to go a little bit deeper and group the series of timestamp of bids by auction and have two stages of stats, stats at auction level that are then aggregated and global stats for the whole set of timestamps of the bidder. You see below a few functions that allowed me to compute those features. Basically, for each auction I compute stats that are: min, max, range of timestamps, and then I compute a bunch of things about interval between two bids: mean interval, standard deviation, percentiles. I then aggregate those results for all the auction a bidder had always in the same ideas of simple stats. # Compute stats about a numerical column of table, with stats on sub-groups of this column (auctions in our case). In a desperate attempt to increase my score, I though about replacing categories in the bids dataset by real values by computing general stats about each category of each variable, and replacing this category by stats about this category, in my case the probability of this category to belong to appear in a bot’s bid. I am aware that this is getting close to the danger of Data Leakage because you are explicitly introducing information about the target in the features. However, I feel like because the real value you use to represent the category is computed on the whole dataset, it might in some cases be ok because it is a very aggregated info, provided you have a lot of data in each category. In this case, I think that if was definitely a data leakage because I got a 0.97 AUC on my CV but a 0.86 score on public leaderboard (a big drop from my results without those features). But it was worth trying! I also wanted to make a special case for merchandise category, and have a couple of features per category indicating in a way how the bidder participated in the auctions of this merchandise: the number of bids in the category and the percentage of his bids made in this category. This did not changed my score in any way, probably due to the fact that very few bidders actually participate in multiple merchandises if I remember well. There are a lot of features I could have tried if I had time and motivation. You will find a lot of different things in others feedback from this contest. There are a lot of great and nice features I do not have, however, it seems that what I got here already gives you pretty good results. Lots of people like to look at the contribution of each feature in the final classifiers. I’m sure it might give some information and ideas about how to improve your features. I didn’t do it in this competition. And I’m anyway not a big fan of interpreting a Machine Learning model, something also “criticized” in the great kdnuggets blog article “The Myth of Model Interpretability”. Well, finally we need to compute all those features from our dataset so, I know this block of code is kind of dirty, but since I wanted to be able to include of exclude features at ease, this was my solution. This is the moment when multi-cursors feature of Sublime Text takes stats being very useful. Now that we have a nice dataset, we need to make it a Machine Learnable one. Because we still have categories, we have variables that have a lot of different spans, etc. To do this, I used the DataFrameMapper class of sklearn-pandas package that allows you to easily transform a DataFrame into a numpy matrix of numbers. Now that we have our dataset, let’s learn to predict bots! Note: It is important to note that the performance results you see in this section are below my final score because to make this code more quickly runable I removed some of the categorical features that was used to get my final score. Having been taught Machine Learning in a large part by a researcher in SVM and kernel methods, my first Machine Learning try on a problem is often to use a SVM. One important thing is of course to think about finding the optimal value considering the AUC a scoring metrics, and not the classification rate. This obviously increase a lot your performance. I chose to use 10 CV because my “bot” class contains really not a lot of values and I don’t want to drop to much of them in the test fold. Now that we have our CV-optimized hyperparameters, let’s learn this classifier on the full train set and evaluate it on the test set. Ok, now let’s make our final prediction, learing on the full learning set and prediction on the final set. Because of all the categories we kept from bids (highest frequent category use by a bidder, for a few variables), we have a lot of binary features, so it makes sense to use some L1 regularization. However, scikit-learn’s RBF SVM doesn’t have this feature, and I was too lazy to implement it myself so I tried the linear L1 SVM of scikit-learn. Also I wanted to try linear SVM as well. The code is basically the same as for RBF SVM. Also a classifier well known to be great is the random forest. The problem is that it can have a lot of hyperparameters to tune. Basically all the parameters in the trees plus the ensemble settings such as number of estimators, but also random feature subspace size if you want, etc. I chose to only CV grid search the number of estimators and the max depth of the tree. The idea of this code is again very close to the one of SVMs. But in this case I only used one grid search. If I wanted a perfect there would definitely be things to factorize between those different classifiers (and scikit-learn is actually very good for this with their consistant interfaces across classifiers). # Ok, I actally want to choose these paramters myself! I'm god here, I do what I want! I finally submitted predictions of my random forest for evaluation on the private leaderboard. I think this competition was more about feature engeneering than the pure Machine Learning part. There are a lot of things I could have improved in my work. First, I could have used more complex features. Some good examples can be found for example on Kaggle’s forum of the competition “share your secret sauce” thread, or other similar threads. I think more complex time series analysis could have been done on bids times. I did not tried to clean the dataset, but I think that removing some wierd points from the training dataset might have been a good thing. Also I think there might be interesting ways to deal with the imbalance of the dataset (other than class weighting that I did of course), but I didn’t found time to dig into this. Finally regarding the pure Machine Learning part, using ensemble of different classifiers like some people did could also have improved the results. Anyway, I am quite surprised of the good results I got with so simple features and model compared to what some other people did. I studied ASI (Architecture of Information Systems) at the INSA of Rouen, and during the second semester of the 4th year and the first semester of the 5th year, students work on a big R&D-like industrial project (PIC, for INSA Certified Project) for a company, carried out by teams of students. 5 projects are realized by 6 teams of 7 to 9 students during 1 scholar year, at a pace of 25 to 28 hours per week. One of those team work as a subcontractor for another team, and this team only exist during the first half of the project. The subject my team worked on was to make an Open Source web tool allowing each and every one to be able to do Geographical Business Intelligence (GeoBI) as easily as possible, without prior knowledge of the “theory” of GeoBI. This subject was proposed by our client, the Public Research Center Henri Tudor, based in Luxembourg, now called Luxembourg Institute for Science and Technology (LIST). The subcontractor team worked with mine on this subject. To summarize quickly, Business Intelligence (BI) allows you to analyze big quantities of data, usually structured around lots of dimensions. For example revenue as a function of time, geography, clients, business sector, products, etc. Business Intelligence allows you to analyze these masses of data, allowing you to make up your decisions based on those. This preliminary step of Business Intelligence was not part of the project and is specific to each Information System. The goal is to collect data coming from multiple sources in order to constitute the most accurate and complete database possible. These data are stored in data warehouses and data marts. They will constitute OLAP databases. The first step of any BI analysis is to select which part of the data is interesting regarding the study you want to do (e.g. : select data for France in 2014 only). This is an OLAP slice. Then, the most common data processing is to aggregate the data to get the most relevant results (e.g. : aggregate by month and department). This is an OLAP dice. This is – in a very simplistic way of course – the principle of OLAP: limit the range of data studied and aggregate those at the most relevant level. The second step of a BI analysis is to render the data for the user. The easiest display is of course the table. However, it is not the most practical way to interpret the data. We therefore use graphics, choropleth map, etc. One of the major “issue” we had to tackle was to provide an efficient cross-filtering on the interface. You can see this in the demonstration video above. Indeed, the filtering function is very useful for the user to be able to see how data are distributed across the elements of each dimension and explore the OLAP cube. This filtering function will therefore be highly solicited and should be very efficient while still being able to handle big volumes of data. On this diagram, you can see the OLAP cube stored on the server on the left, and the charts we need to display on the right. The first solution is to ask our OLAP server, GeoMondrian, to compute a smaller cube of data containing what we are currently studying. Here on the diagram, the cube in the middle contains data for French regions, years and mode of transportation. This temporary cube is downloaded in the browser of the user and is then given to the library crossfilter. Crossfilter will then be capable of computing projections of the cube on each dimension, and these projections will be used by dc.js to display the charts. In this solution, the interface will be very responsive when filtering, because crossfilter already has got all the data he need to compute the projections while taking filters into account. It will take less than a second to compute new projections taking new filters into account. However, the defect of this solution is that the number of values in the temporary cube is the product of the number of elements studied in each dimension (e.g. for 6 regions, 2 years, 3 mode of transport we have 6 × 2 × 3 = 36 values), and this size grows exponentially. We will only support reasonable volumes because data will eventually become too big to be loaded in a reasonable time. The alternative solution would be to ask GeoMondrian to directly compute the projection of the OLAP cube, after filtering, on each dimension studied, without computing the temporary cube that is too big. In that case, the size of the data we load is the sum of the number of elements in the dimensions we study (e.g. for 6 regions, 2 years, 3 mode of transport we have 6 + 2 + 3 = 11 values), and this size grows linearly. We will be able to support big volumes because we load much fewer data (as long as GeoMondrian can process those volumes of course). However, the drawback of this solution is that when the user changes the filters, we need to ask GeoMondrian to compute the projections on each dimension again, taking into account the new filters. This will significantly slow down the interface at each filtering because we need to query the server again while crossfilter only needed to do a few computations locally. Another issue with this solution is that our chart library, dc.js, is depending on Crossfilter as a data model. We can’t just give it some data. To solve this problem and make this alternative solution possible, we developed a small library that we called Crossfilter Server. This library has almost the same I/O interfaces as Crossfilter (only the initialization should differ). And Crossfilter Server will be able to reproduce Crossfilter’s behavior without having the full temporary cube, and by delegating all the computation to an API that will, in our case, call GeoMondrian. Therefore, we can either use dc.js with Crossfilter or Crossfilter Server. Our final solution was to use both of these solutions, using one or the other depending on the volume of data you are studying, and switching dynamically from one to the other when needed. This article is of course a quick summary of a very long project. If you want to know more about this project, you can read the documentation available in the wiki of the GitHub repository and take a look at the code of the components listed above. If you want, you can even contribute to the project by making pull-requests to it. I just finished the excellent book Seventeen Equations That Changed The World by Ian Stewart! From the title, you might think that this book will describe a few equations. It’s actually a lot more. Each equation is actually just a pretext to present a period of time and / or a field of mathematics related the equation. Don’t expect any important calculus in this book, it’s all about historical scientific context and usage. And it was actually a good thing for me. I knew and had used almost all the equations equations presented in this book, but there is actually not a lot of things that I knew from this book. As I said, it’s actually a lot more than about the equations. For example, the first chapter about Pythagoras theorem will of course present the history of this well known formula and some ideas about the proof of it. But a big part of the chapter is about the history of mathematical symbolism and how we went from the original Pythagoras theorem, that was a sentence, to the current notation $a^2 + b^2 = c^2$, the difference between math and science knowledge at that time and math nowadays (for example about the shape of Earth). The chapter will also evoke all the mathematical field of geometry, mentioning Elements by Euclid, the definition of trigonometry and its usage for map making and astronomy for example, the existence of non-Euclidean geometry, and even more! I would highly recommend you this book if you like science and/or engineering, and even if you’re not a particularly a big fan of math. If you want a preview of the book, you can read an extract at Google Books or Amazon for example.